What is it about blue? It can be timeless or trendy. It doubles as a color and a neutral. And depending on the tone, the hue can be moody, tranquil, or cheery. Blue's versatility is what makes the shade work well in so many different spaces, even the heart of your home. 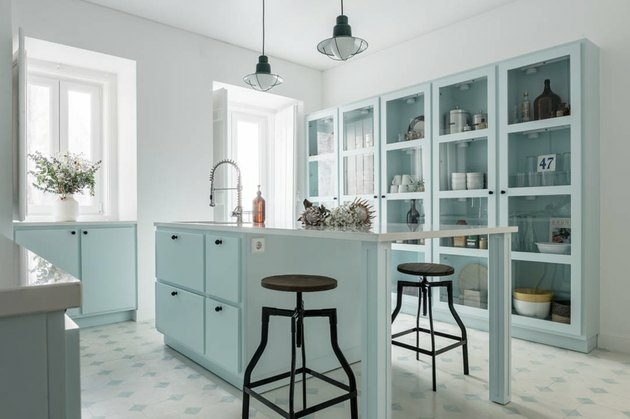 Scroll on for 11 cook spaces that show us how to rock blue cabinets in the kitchen. 1. Top them with butcher block. 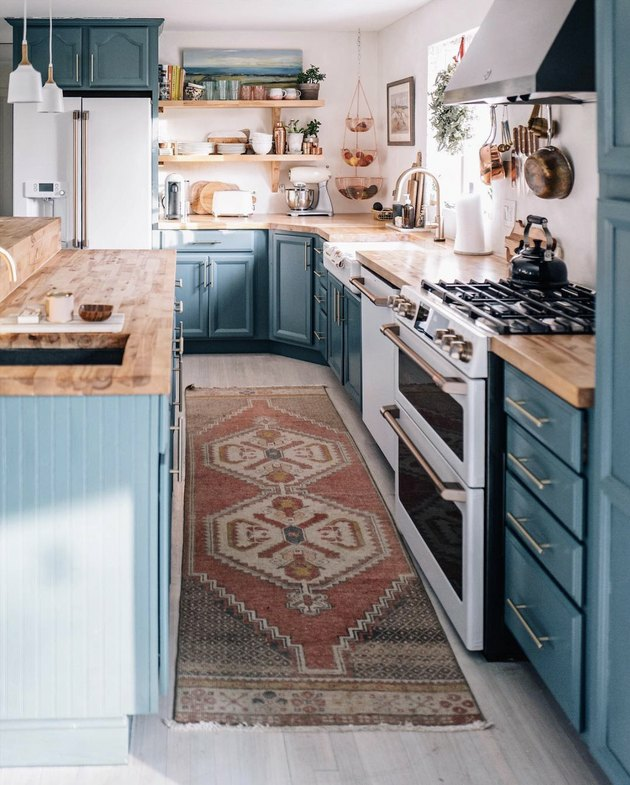 In her home, which is fittingly dubbed The Cozy Ranch, lifestyle blogger Jess Kirby paired her blue cabinets with butcher block countertops. With complementary open shelving, the wood gives her little scullery a rustic, country feel. 2. Play up wood details. Rather than completely coating this cupboard in paint, a few of the drawers of these Christopher Peacock custom cabinets were left au natural. 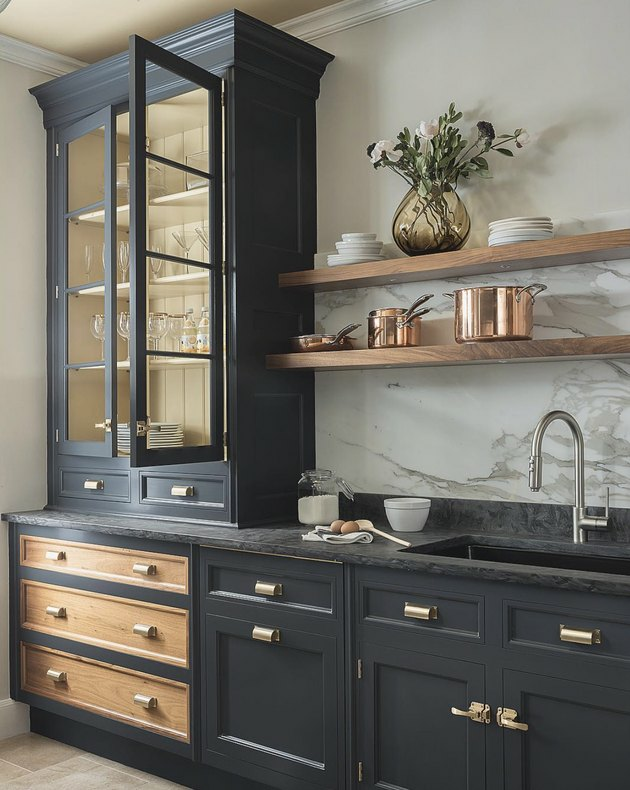 When paired with organic wood, the moody blue-black cabinetry is warmed up, evoking a chic, pastoral vibe. 3. Pair with bright white. With a bright white backdrop, these indigo Shaker-style cabinets are the star of the show. 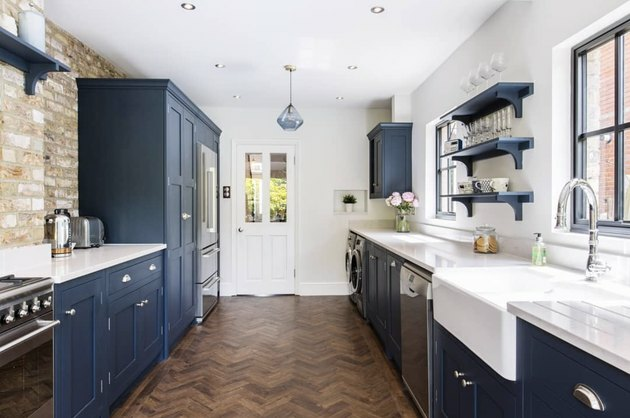 To further flaunt the blueness of these cabinets, the United Kingdom-based design team over at Burlanes Interiors kept all other decor neutral, from the light brick accent wall to the white countertops and farm sink. 4. Be subtle with gray-blue. If true blue is too flashy for you, go with a more neutral tone. 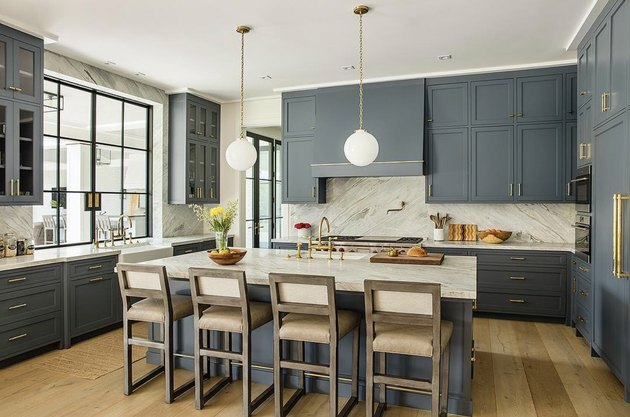 These gray-blue cabinets in a kitchen by Gina Holz Designs are an understated and timeless representation of the hue. 5. Embrace the waterfall edge. In this model home, the husband-and-wife design team behind Leclair Decor wrapped the inky kitchen island in a sleek white stone with a waterfall edge. 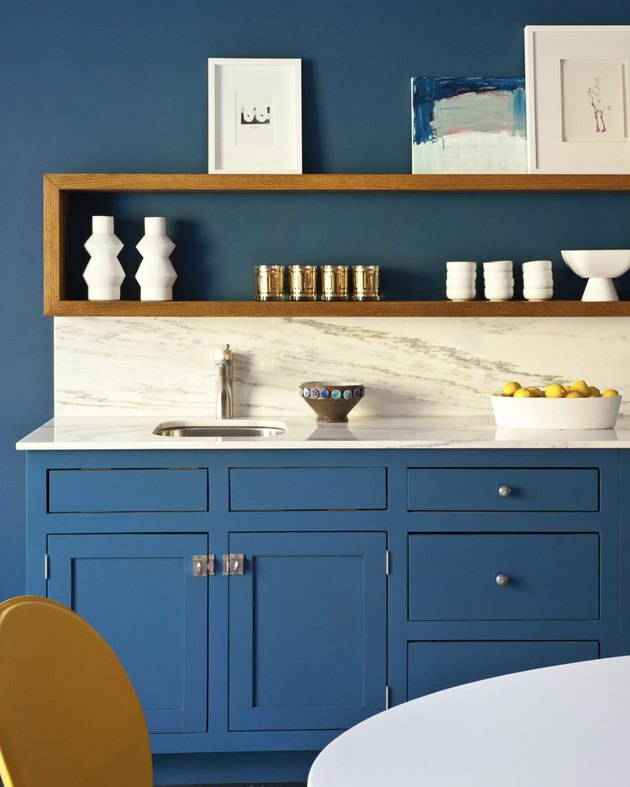 Painted in mellow navy, the blue cabinets provide a dynamic contrast to the shiny white countertops and backsplash. 6. Be bold with two tones. 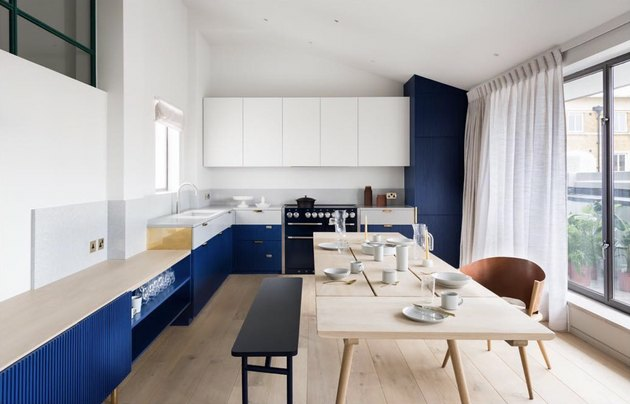 Contemporary white upper cabinets and cobalt lower cabinets look uber-chic in this Covent Garden home by Studio Ulanowski. We also love how the designer continued the built-ins into the dining area to create a credenza for additional dish storage. 7. Opt for baby blue. Baby blue sets the tone for a calming and cheerful space in Casa C'alma, a chic boutique guest house for rent in Lisbon, Portugal. White walls, cabinets with glass doors, and an open island add to the already bright and airy feel of the kitchen. 8. Don’t be afraid of monochrome. Be bold and paint your walls the same color as your cabinetry, like artist Angela Chrusciaki Blehm did in her vibrant home. Coated in Benjamin Moore's Summer Nights, the cupboard blends seamlessly into its indigo backdrop. 9. Make a modern statement. 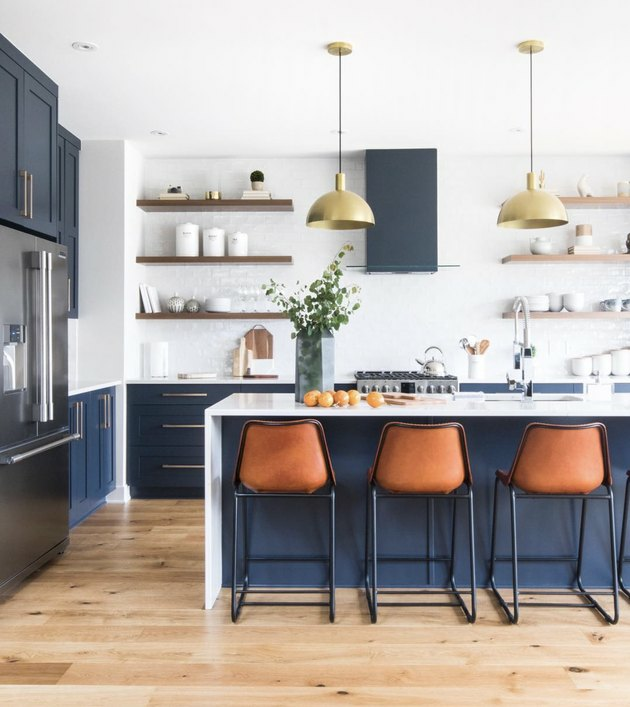 California-based interiors studio Blackband Design employed modern design elements to bring this blue kitchen to life. 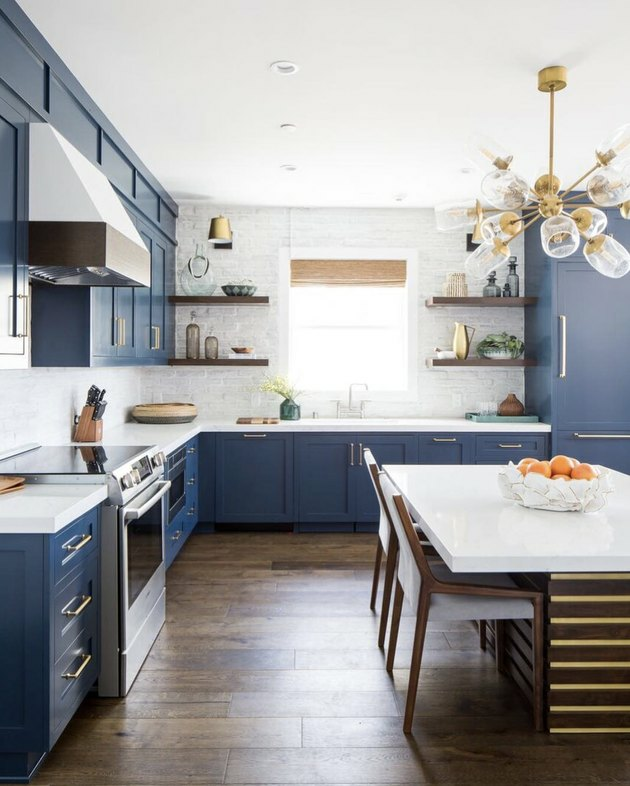 A gold-accented wood island, avant-garde chandelier, sleek hardware, and floating shelving present blue cabinets in a contemporary application. 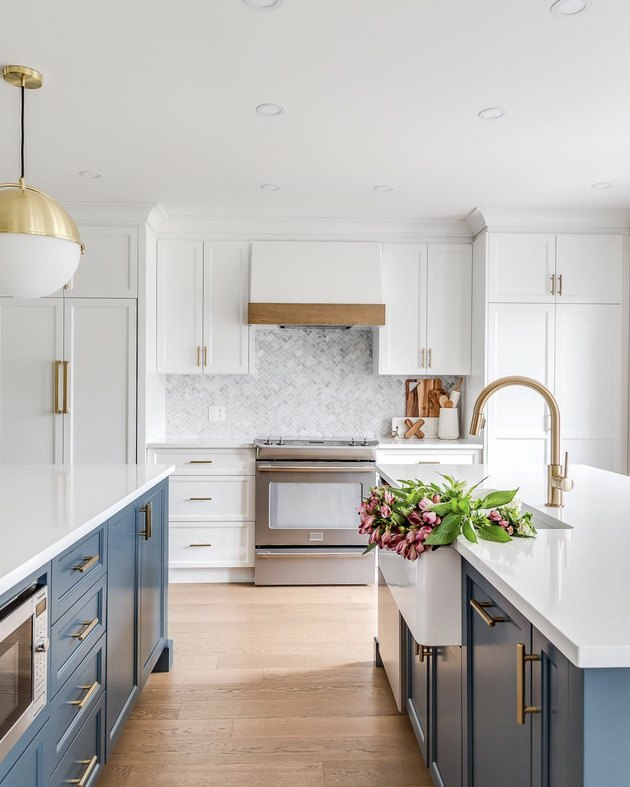 The designers behind Hibou Design & Co. added a pop of color in this all-white contemporary farmhouse kitchen by highlighting the double islands with a soft shade of custom-blended cerulean. The tranquil color grounds the bright space, while also acting as a bridge to visually link the adjoining living and dining rooms, which also happen to incorporate blue tones. 11. Give color blocking a try. It's no surprise that the 1920s home of Perri Perry, a prop stylist and stager, is bursting with unique and eclectic elements — and the kitchen is no exception. A dark blue accent cabinet, seamlessly built-in, is the star of the show in this all-white space. 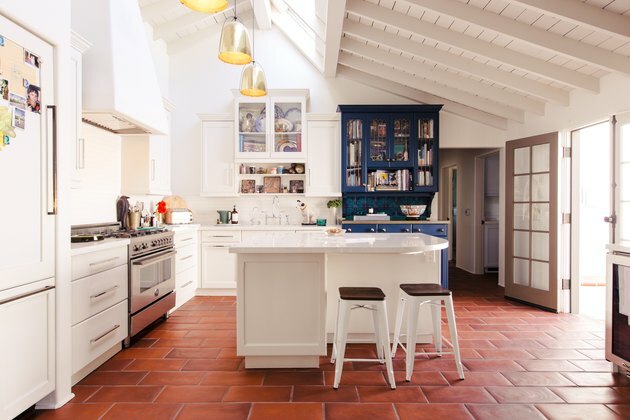 And we love how it complements the rectangular terra-cotta floor tile. As a lifestyle writer working from home, Marissa has a deep appreciation for the time and effort people put into personalizing their spaces. Her stories have been featured in Apartment Therapy, Cosmopolitan, Domino, Dwell, Houzz, Lonny, Parents, Southern Living, The Knot and Zillow.